Location: 50 km from Palermo, on a western spur of Monte San Calogero, in the San Leonardo Valley. The town has ancient origins, even if these have not been clarified with absolute certainty. The name, which is derived from 'caccabe' [horse-heads], may have been given by the Carthaginians who took refuge here after their defeat at Himera in 480 BC. The Arabs promoted its growth in the 9th C and the Normans built the castle that made it one of the major strategic centers in Sicily. It later became a fief of the Chiaromonte family [14C], the Cabreras [1420-1480], the Henriquez [17C], and the Despuches. The most characteristic monument in Caccamo is, without any doubt, the Castle, which towers majestically above a sheer-dropping rock. The Castle is solid and compact in appearance, a typical fortified building with continuous curtain walls, bastion and battlements. Built by the Normans, possibly on the site of a pre-existing fortress, it was altered on various occasions. - in the 14C, in the Chiaromontine age, and at various other times. The windows in the facades and the balconies testify to the various historical and artistic styles. 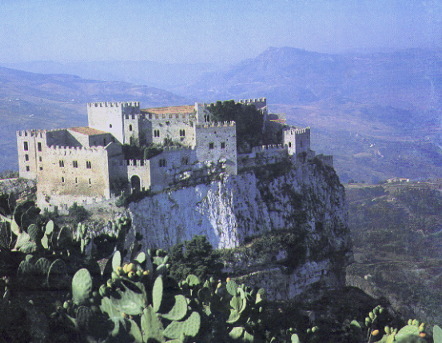 This is the castle where in 1160 Matteo Bonelli plotted against King William the Bad. On the square of the Matrice are the Chiesa Madre, the Oratorio with notable baroque stuccos [damaged by humidity], the Monte di Pieta and the Chiesa del Purgatorio. The Chiesa Madre, St. George, built by the Normans in 1091, altered in the 15C and transformed in the 16C, has a facade dating from 1660, which is remarkable because of the scenographic nature of the decoration and the relief of St. James, by Gaspare Guercio. The powerful campanile was built over the remains of a Chiaromontine tower. The church, with a central nave and two side aisles, contains a 15C painted cross, a font attributed to Domenico Gagnini, the Sacrament Chapel, and a painting of the Virgin with Saints. In the medieval Chiesa della SS Annunziata, which has a baroque facade, we can admire a carved wooden 18C pulpit Nearby is the Chiesa di San Benedetto alla Badia, which has a fine majolica floor attributed to Nicolo Sarzana [18C] and a majestic baroque railing for the enclosed nuns' gallery. Events: the Castellana di Caccamo, a representation in contemporary costume of the various lords of the castle, held in the middle of August. 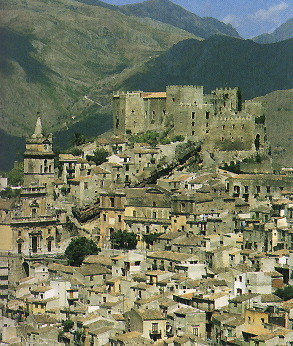 Excursions: to the Madonie, the ruins of Himera, Cefalu, Solunto, Bagheria, Palermo and Monreale. excerpted from "Sicily and Its Islands"
The Arab conquest of Sicily, initiated in 827 was preceded by numerous Saracen invasions of the island while it was still under Byzantine rule. By 902 the island belonged totally to the Arabs. For the preceding 16 centuries, the character of the island had been Greek. The Arab influence on Sicily was profound. The Sicilian language preserves many Arabic words and many popular superstitions and practices are Arabic in origin. Norse invaders in the 11th century forced the Arabs to flee. Sicilian Arabs relocated to other countries and the island then came under the control of the Normans. The Norman era closed after 130 years. They had appeared on the Sicilian scene to reconquer the island for Christiandom and the west. Unlike the north, with its network of vigorously independent urban centers, southern Italy experienced a significant consolidation after its conquest by the NORMANS. Bands of these invaders arrived in Italy early in the 11th century. Starting c.1046, ROBERT GUISCARD and his successors expelled the Saracens and Byzantines and carved a powerful domain out of APULIA CALABRIA, Campania, and Sicily. Although the Norman territories remained a fief of the papacy, papal overlordship became a mere formality in the 12th century--especially after 1127, when ROGER II united the southern part of the peninsula with Sicily; he assumed the title of king of Sicily in 1130. While the Normans were consolidating their rule in southern Italy, the papacy and the Holy Roman Empire continued their struggle for dominance in northern and central Italy. In 1077, Pope GREGORY VII humbled Holy Roman Emperor HENRY IV at Canossa during the INVESTITURE CONTROVERSY. Later, Pope ALEXANDER III successfully supported an alliance of northern cities known as the Lombard League against the efforts of Emperor FREDERICK I (Barbarossa; r. 1152-90) of the HOHENSTAUFEN dynasty to impose imperial authority over them. Early in the 13th century the Hohenstaufen FREDERICK II succeeded in uniting the thrones of German and Norman Sicily. Although Pope INNOCENT III (r. 1198-1216) opposed the emperor and advanced far-reaching claims of political and religious supremacy, Frederick established one of the wealthiest and most powerful states in Europe, centering on his brilliant court at PALERMO, with its great cultural innovations. The papal-imperial conflict culminated in 1262 with a papal invitation to Charles of Anjou, brother of King Louis IX of France, to conquer Sicily. Charles, the founder of the ANGEVIN dynasty of Naples, ruled from 1266 as CHARLES I, king of Naples and Sicily. French rule, which introduced feudalism to the south at a time when it was weakening elsewhere, was highly unpopular, and in 1282 a successful revolt (the SICILIAN VESPERS) resulted in the separation of Sicily from the mainland. PETER III of Aragon was made king of Sicily while the former Norman domains on the mainland remained under Angevin rule as the Kingdom of Naples. In the 15th century both kingdoms became Spanish possessions; they were then reunited under the title Kingdom of the TWO SICILIES.